Adjustable Prop System has got 22 kN carrying capacity. It is very practical and efficient for carrying slabs duty. Using this system an ideal way to built short floors. Also Prop System is an ideal way to us efor projects have a lot different spread columns and walls. Pipes are used by TSE certificated and mechanical tests have done on. Nuts are CE certificated. 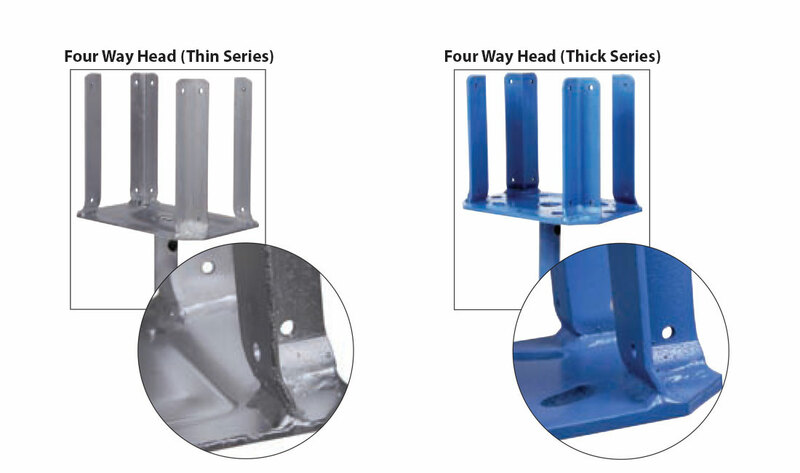 Base plates have got special forms for high strength. The holes on the top pipe are being done on every 10 cm by electronic drill which is never cause deformation. System has special antirust paint and also galvanizing is possible upon request. Pipes tested by TSE standard; (Not disposal, product of Noksel, Yucel or Borusan Mannesmann) All pipes are applied to mechanical and hydraulic tests.Thicknesses same in the whole sections of pipe. Production with Robots (Production in automatic welding machines.) Circular welding,the hard welding type carried out by robots. 6mm thin series four way head gets extra resistance thanks to the special extraction process from the metal sheet. The welded parts of the angle iron that we use on four way head are outwardly bent which enables a double sided welding application. Through this application, the deformation of the product is minimized. 8 holes made In 8 mm four way head thick series for the ease of application. These holes reduce the weight of four way head and enables a practical application.